Philippine Airlines Promo 2019 - 2020: Independence Day 2016 Sale! Philippine Airlines Promo 2016: Buy 4 tickets to our domestic destinations and fly another family or friend for FREE! 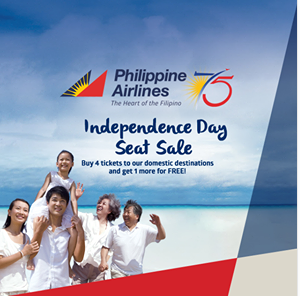 Enjoy an unforgettable 4+1 getaway with the family with Philippine Airlines’ Independence Day Seat Sale! Book from June 12-15, 2016. Travel from July 1, 2016 to March 31, 2017 (with blackout dates). MECHANICS FOR ONLINE BOOKING: Free ticket from online bookings must be claimed at any PAL Ticket Office within the selling period. Please present the four tickets bought online. Book your flights now at any PAL Ticket Office, travel agency or via philippineairlines.com. Tickets must be booked under 1 booking reference number. Free airfare from online bookings should be claimed at any PAL Ticket Office within the selling period. Upon claiming, please present the four (4) tickets bought online. Promo is available for Budget Economy only. All passengers must travel together both ways as applicable for round trip travels. *Free ticket is exclusive of government taxes, fees, ticketing service fee and surcharge. **Refer below for blackout dates. Selling Period: June 12-15, 2016. Travel Period: July 1, 2016 – March 31, 2017. **Blackout dates: All Domestic Oct27-Nov6/ Dec16-Jan10,2017, MNL-DVO vv, CEB-DVO vv Aug17-23, MNL-GES vv / GES-ILO vv – Sept1-6, MNL-WNP vv – Sep15-20, MNL-BCD vv/ CEB-BCD vv – Oct13-18, CEB Hubs vv – Jan11-18, MNL-CEB/KLO/MPH vv – Jan11-18/ Jan25-Feb1, MNL-ILO/CEB-ILO vv – Jan19-24, MNL-PPS vv Jan25-Feb1. Seats are subject to availability. Fares are valid for one-way travel and are inclusive of government taxes, surcharges and fees. Free ticket is exclusive of government taxes, fees, ticketing service fee and surcharges. Passengers must travel on the same flight on the same date and must be booked under one (1) booking reference number. All purchases and rebooking shall be done under one (1) booking reference number only. Ticket is non-refundable. Unused ticket is forfeited if not used with the traveling party. Change fee per person of Php 1,500 (Budget Economy) per sector per change is inclusive of 12% VAT plus applicable fare difference. No Show or Non Users fee of Php 1,000 per person, per sector is inclusive of 12% VAT. Ticket is considered No Show if ticket is not reissued or refunded at least 4 hours prior to flight departure or if passenger fails to check-in on time. For tickets that will be reissued at least 4 hours prior to flight departure upgrading to higher fare permitted; reissuance should be equal or higher fare amount. No child/infant/senior discount. Mileage accrual is 50%. Fares with advance purchase requirement and flight specific restriction shall apply.